You remember those old fashioned sock puppets from when you were a kid, right? 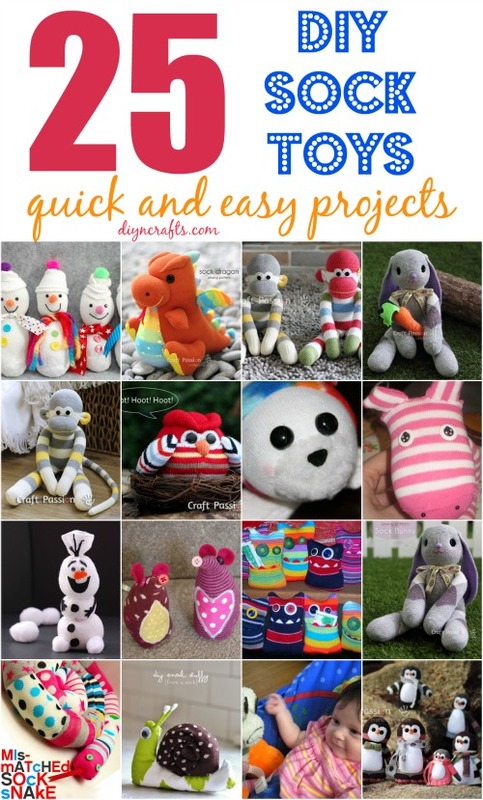 I’ve collected 25 of the most adorable and easy to make puppet animals that you can create for your own kids or grandkids. These are all really cute, and there’s a plethora of animals from bunnies and monkeys to bears and snowmen. Actually, there’s an Olaf the snowman from every little girl’s favorite movie. Some of them need to be sewn and some require just a few steps, so whatever you’re looking to make, I’ve got something in here that’s perfect for your next project. You could even use some of them to decorate your Christmas wreath. These are great for those cold snowy days when you just don’t want to get the kids out of the house. Let them help. They’ll have a blast. Also, these are perfect for homemade Christmas gifts, so if you’re looking for something creative and cute to give a special child for the holidays, this collection has you covered. I’ve got a great collection of DIY gift tags that will top of your perfect gift. 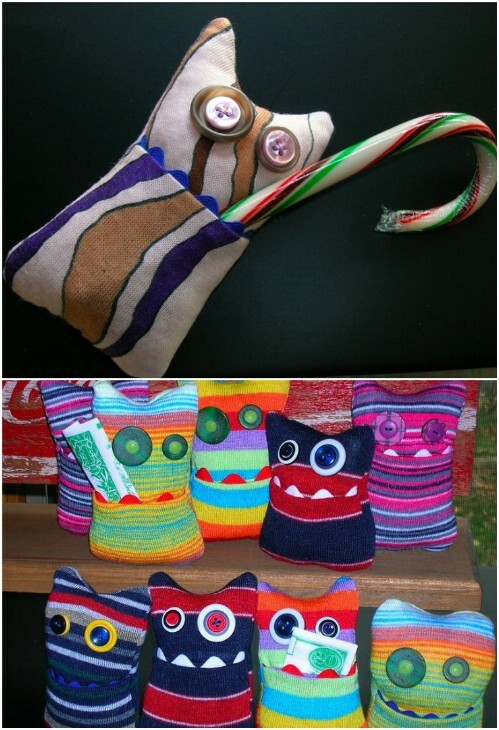 Grab those old socks and let’s get started making the most adorable sock animals you’ve ever seen. You can make an entire zoo that will give your child fun play days for years to come! 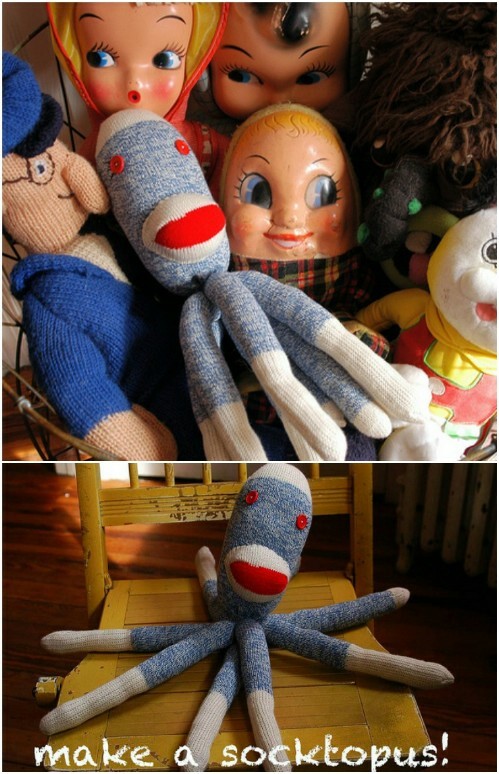 Sock monkeys are the original sock toy, and for good reason. 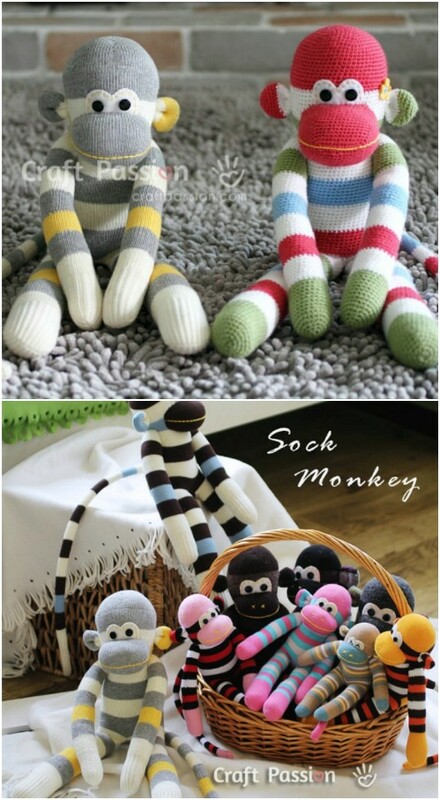 These adorable little monkeys are not only cute, they’re really easy to make. They do require sewing, but not much, and you can create an entire little forest of monkeys in no time. Striped socks look so adorable on these, and it only takes an hour or so for each one. Fill with poly to whatever firmness you want. Ever little girl, and a lot of little boys, love Disney’s Frozen. 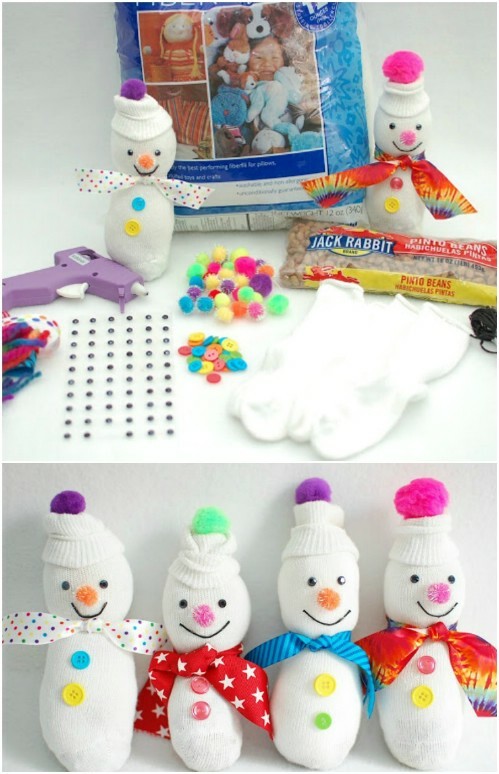 This Olaf the snowman sock animal is the perfect homemade Christmas gift for those little Frozen lovers. The best part is that there’s no sewing involved. You use hair ties and hot glue to put him together. Have fun with this one – your kids will love it, and you could do a few of these for decorations, too. 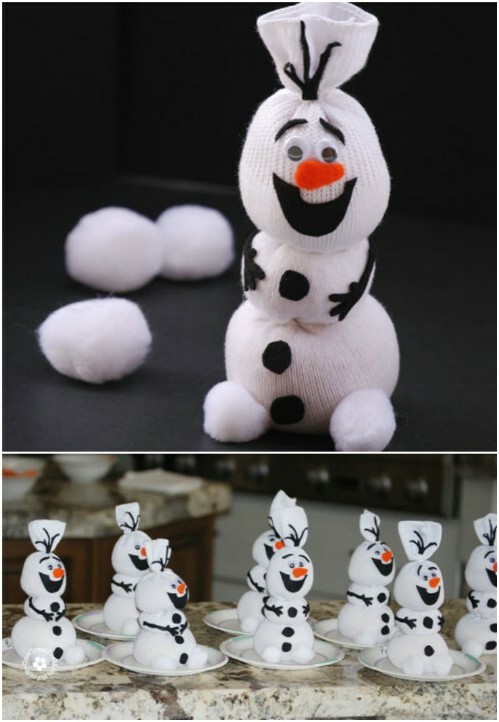 Imagine having little Olaf’s on your Christmas tree! This little sheep is so cuddly and soft! Your kids will love playing with her, and you’ll have just as much fun making her. Although she is a bit more complicated than some of the others in this collection, due to her fluffiness and all, she’s definitely worth the extra effort. 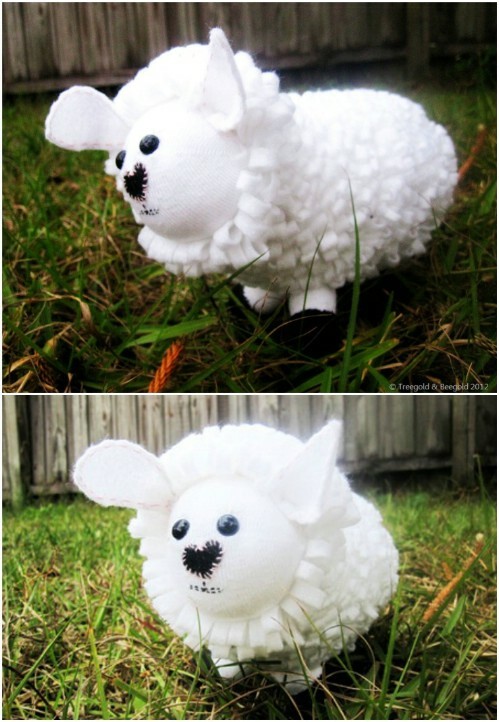 You could do these in different colors and have an entire collection of sweetheart sheep. There’s even a tutorial in here for making the yarn pom-poms. You will need two socks for this little kitty, and the face is entirely up to you. You can draw it on with markers or go all out and use googly eyes and other shapes to create the face. It does require a bit of sewing but the prep work is really minimal, so it won’t take you long to create this adorable little cat. Honestly, who would just love this cute little sock penguin? These are really easy, and the little scarf and bow tie just really make them stand out. You need one crew length sock or two ankle socks for each one. You can also either sew these on the machine, or by hand. They’re not difficult at all. This is a great project for beginners, and one that the kids can help with. Now these are the sock snowmen I remember my kids making. These snow dudes are colorful and so much fun! You can decorate the Christmas tree with them, or just have them sitting around anywhere. 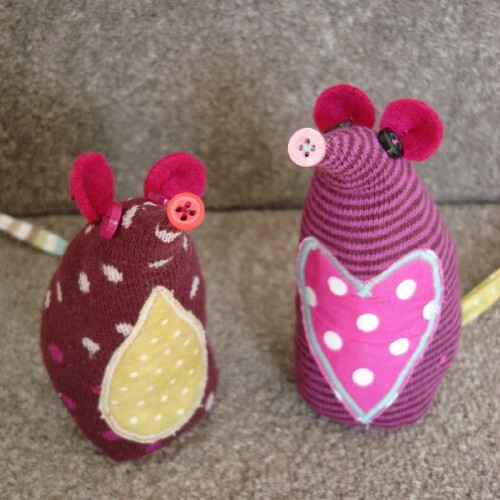 They’re perfect for little ones because they’re so soft and cuddly, and they are super easy to make. Plus, there’s no sewing, and you can customize the colors any way you want. With his tiny little “horns” this sock cow is probably one of my favorites. He’s just so cuddly, and much easier to make than he looks. You’ll need two socks, a bit of yarn, buttons for his eyes and sewing supplies, as well as your stuffing. His big eyes are just too adorable, and he’s soft and cuddly, so he’s perfect for smaller babies. Imagine giving this as a gift at your next baby shower! This little sheep is a bit different than the first. She’s fluffy and soft, and filled with poly stuffing. You can use those really soft socks, the ones that you can get at any Dollar Tree for a dollar, and make her extra cuddly. Use women’s sized socks, although if you wanted to cut down the pattern a bit, this would be really cute made from kids’ socks in a smaller size. These little monsters are anything but scary, and they’ve got a handy little pocket in front for holding any number of treats. These would be great for giving money gifts or candy, or you could just let the kids put whatever they want in the pocket. The fact that they’re easy to make is just icing on the cake. This sock frog is great for a couple of reasons. First, he’s just adorable and second, he’s filled with rice. You can microwave him and he’s the perfect companion for when you need a little heat, like for minor sprains and strains. Kids will adore having him with them when they’re feeling blue, and he’s really easy to make. In fact, you should have a couple of them around, just in case you have more than one kid who needs him. 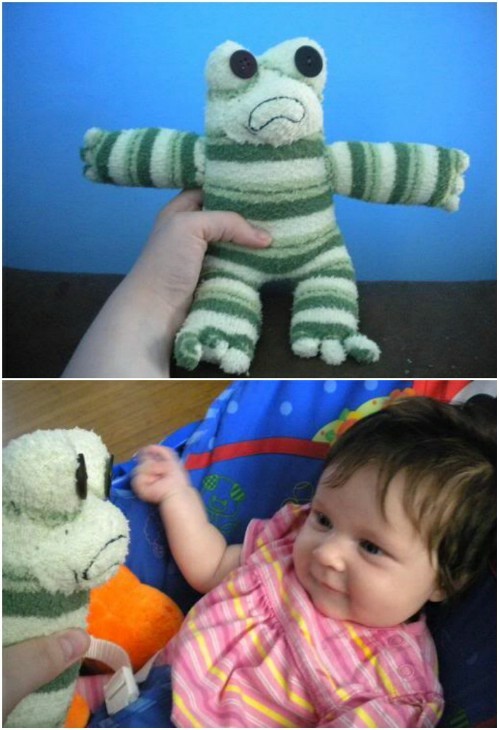 Ok, so for babies, this rattle animal made from socks is perfect. If you’ve ever wanted something really unique for a baby shower, this is definitely it. It’s filled with poly stuffing just like the other animals in the collection, plus it has a jingle bell to give it a great rattle sound. It’s perfect for little ones. You can make a straight handled rattle or curve the handle to make it easier for babies to grasp. 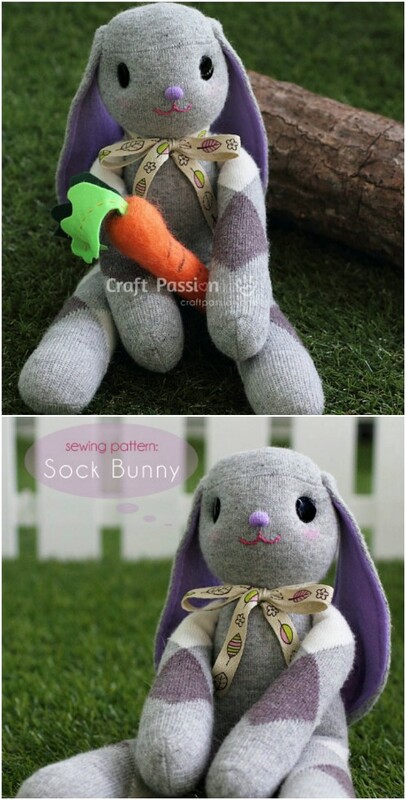 If you’re going to make a sock bunny, you might as well give him adorable lop ears, right? 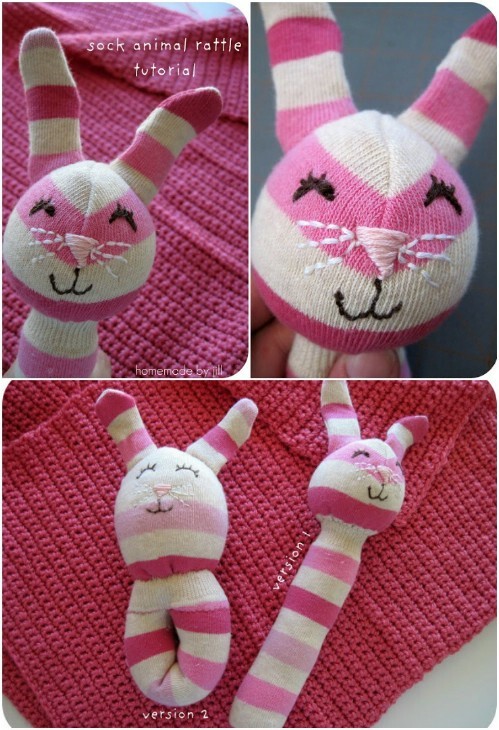 You can use different sizes of socks, like baby, women’s, etc., and make different sizes of these bunnies to have an entire lop eared bunny family. 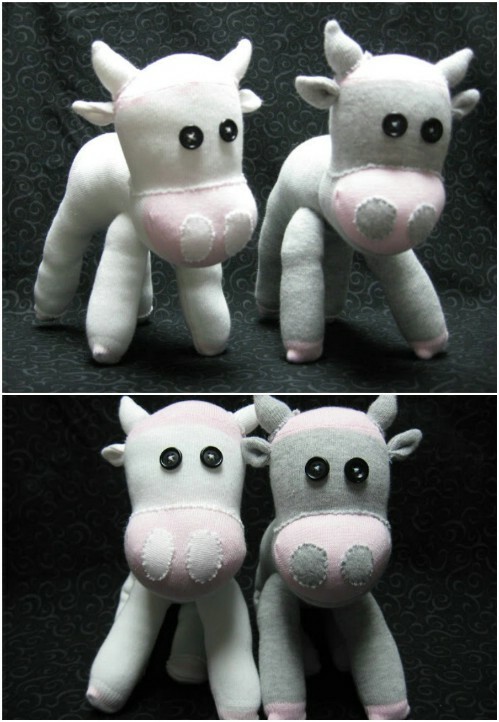 They’re not difficult to make and the hand sewn face is just too cute. 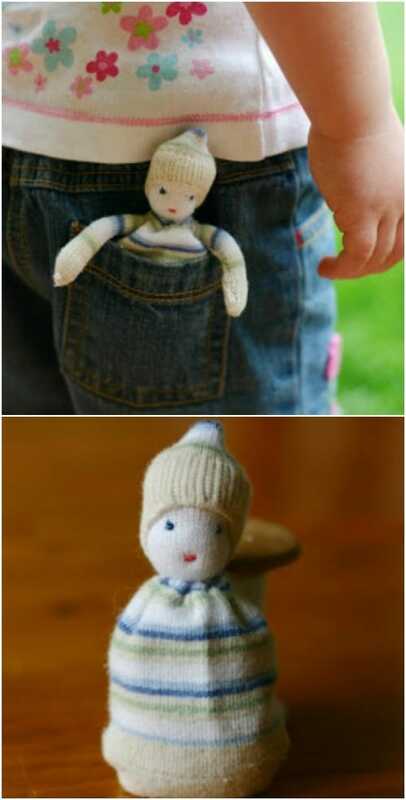 I think this sock doll would be the perfect stocking stuffer for any little girl. You need two socks, one plain and one patterned, and it takes just a bit of sewing. This is really cute and fits right into a pocket. There are a couple of ways you can create this one, so it’s really up to you how she looks when she’s done. Zebras don’t normally get the spotlight, but this striped zebra definitely deserves it. He’s cute as a button and pretty easy to create. You’ll need striped socks in whatever size you want, depending on how big you want him, and some hand sewing supplies and stuffing. He’s decorated with buttons and such, but if you’re making him for a really small child you might consider sewing on his face and avoiding buttons that may fall off. I absolutely love these little owls. There are different sizes of these, depending on the size of your socks. 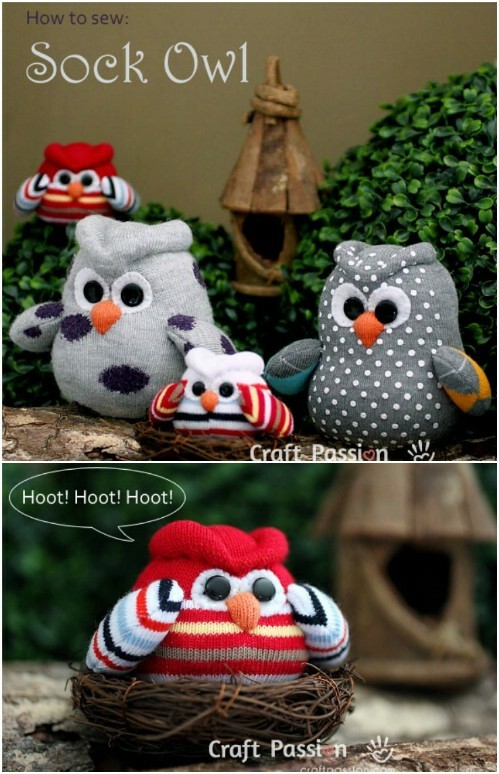 Imagine having this little owl family in your home! I love those big eyes, and they’re really simple to create. These are stuffed with silica beans, and you could even leave out the stuffing and make them into ornaments for the tree. 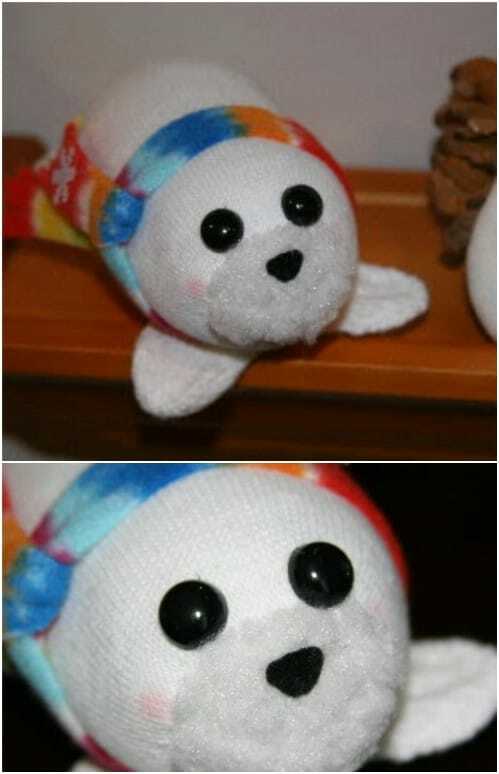 With his huge eyes and cuddly appearance, this sock seal is really adorable. The best part is there is no sewing required. You can make this easily within about an hour or so. This would be so perfect to add to your holiday decorating, and imagine the little family of seals that you could have. I love the softness and I just can’t get over his huge eyes. 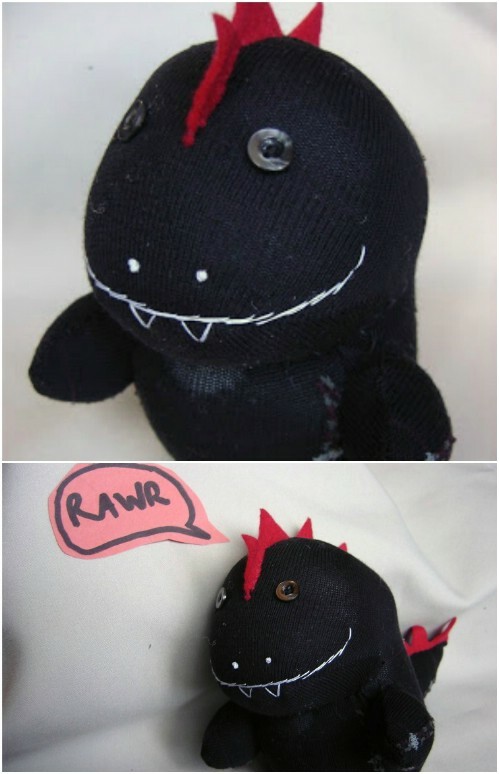 Little boys especially are going to love this sock dinosaur. He’s not at all scary and actually kind of cute. There is a bit of sewing required to make this one, although it’s not difficult at all. You can use whatever color sock you want, but I think the black looks really good. The face is embroidered so you can be really creative here. Overall, this is a really easy and super adorable sock project. Or, socktopus? This is actually one of my favorites from this list. The really neat thing is, even though he has eight legs, you only need the one sock. You should probably make sure you have a relatively long sock, though. There’s a bit of sewing to this one, mostly to get the legs right, but once he’s finished, he is one adorable little socktopus. Ok, so while this isn’t just a sock animal, it does have a sock animal, so it counts in the collection. 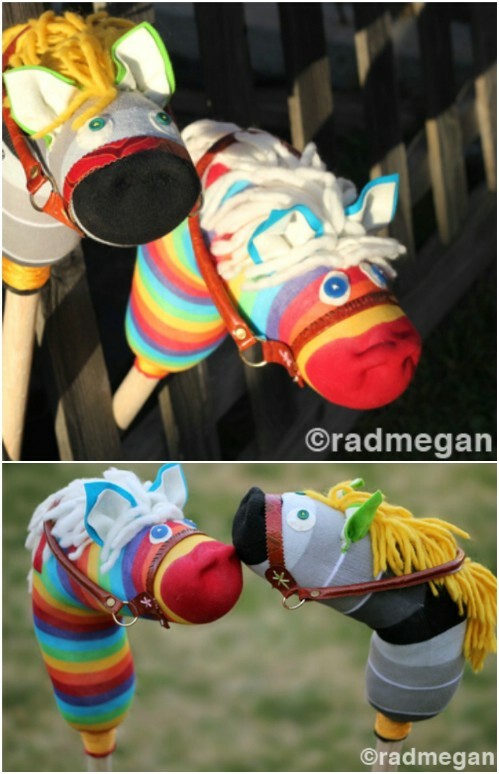 Every kid wants a hobby horse, and this one is much easier to make than it looks. You’ll need men’s socks for this one, and it does require a few power tools. 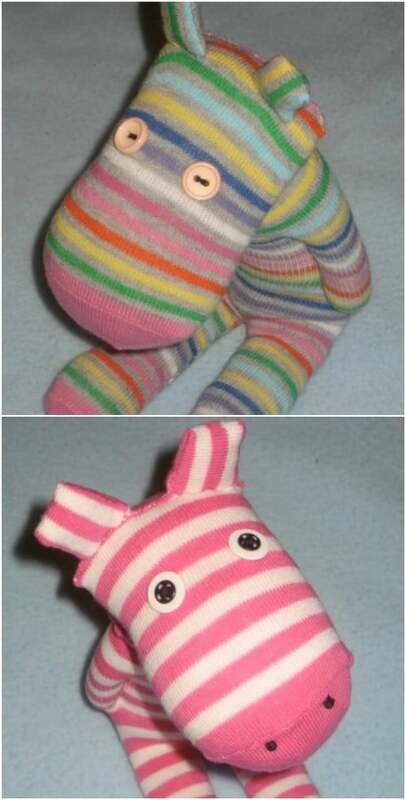 Like I said, it’s not only a sock animal, but I had to include it because it’s just too adorable to leave out. This one isn’t made from Christmas socks, unless you want to use those, but he’s perfect for holiday decorating. You can even customize this one depending on the breed of dog that you want. How’s that for a sock animal? I love the browns, especially with the Rudolph nose. He’s the perfect companion for your Christmas tree. 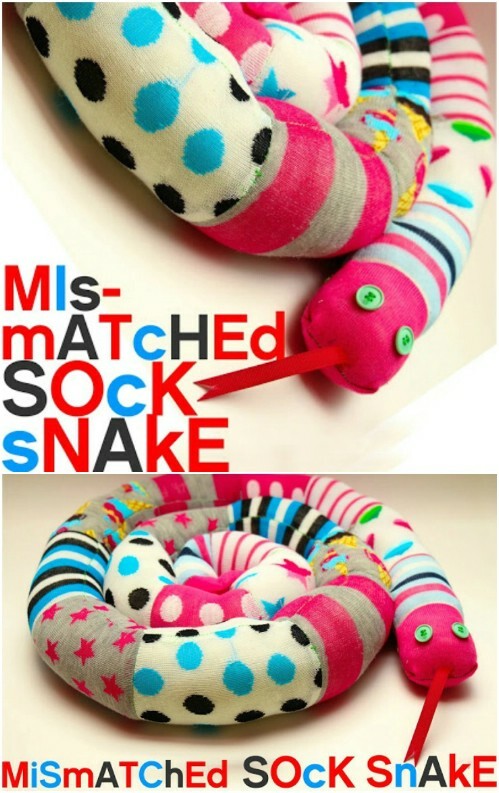 So, a sock snake may sound obvious, and this one is really easy. Mismatched and differently colored socks give him real character, and kids are going to love playing with him. You could actually use one of these at the door to keep back cold air in the winter, or just let him curl up anywhere. 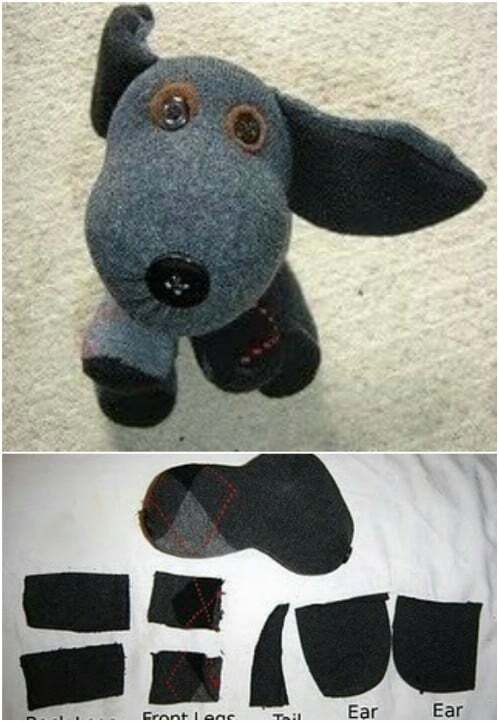 You basically just sew the socks together, add stuffing, and create his face and forked tongue. 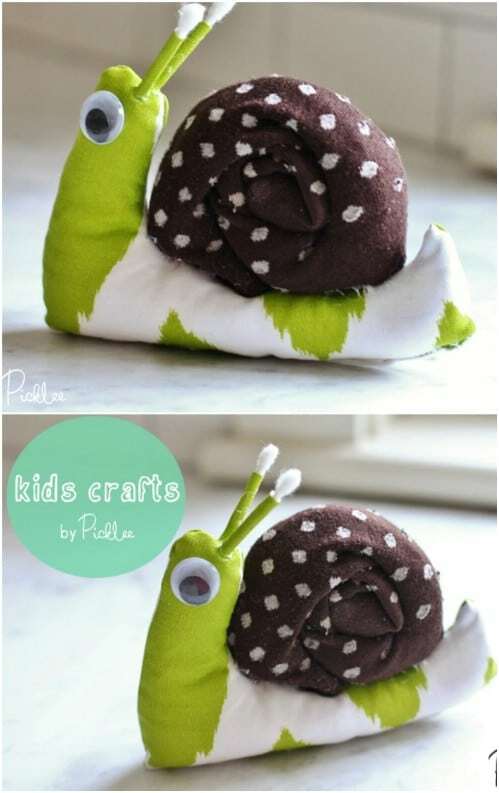 You need a relatively long sock for this snail to make his “shell”, and it’s a relatively easy project. You just fill the long sock with stuffing and roll it into the shell. Add the body and a cute little face, and you’re all done. 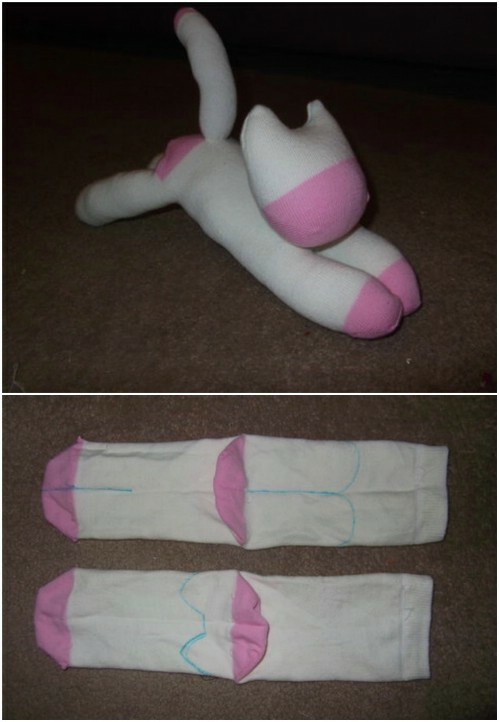 There’s a bit of sewing with this one to make the body, but it’s still a pretty easy sock animal to create, and one that kids will love. 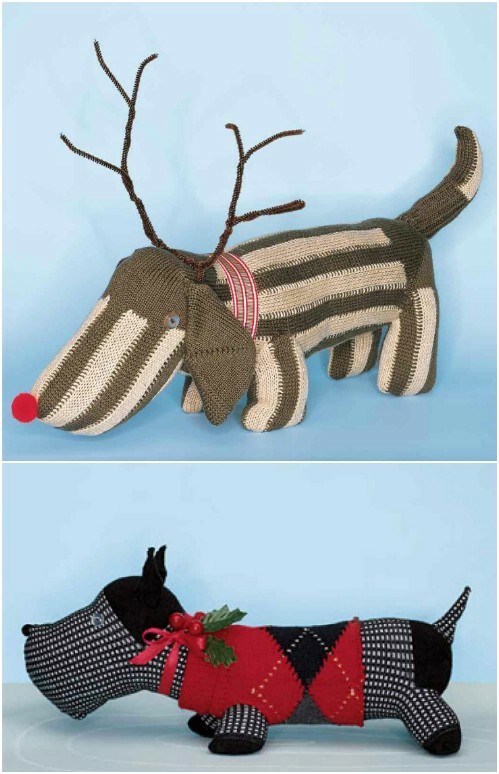 This sock dog is entirely too cute. It only takes one sock to make it, too. It also only takes about an hour from start to finish. These would be really adorable in different colors, and they’re so soft! 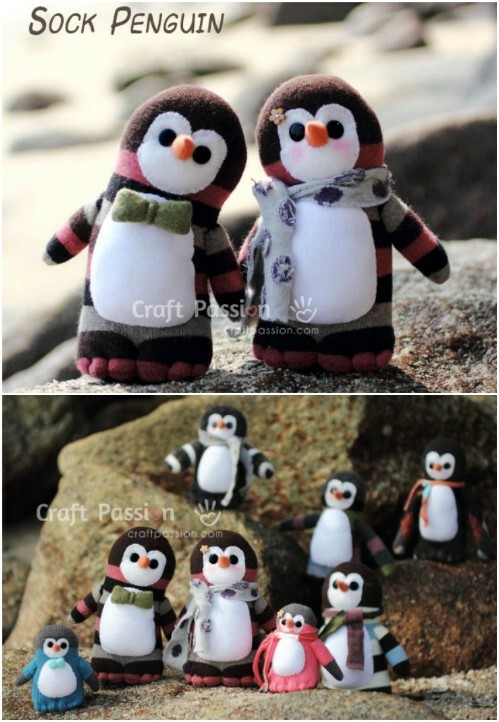 Customize them by changing up the faces if you want, although the pattern makes it perfectly adorable. It’s not terribly difficult, so this is definitely one that you’ll want to give a try. We’ve done a dinosaur, so why not a dragon? Honestly, people are not going to believe this one is homemade. He looks so perfect, and you can do several of these in different colors, or in different sizes. Use buttons for the eyes, but if you’re making this for a baby, I recommend sewing in the eyes in freehand instead of buttons. You could customize this in a number of different ways and it would still be just as adorable. Idk how to do these socks toys? So if u mind get us the steps or you’ll be the worst website ever? Actually they’re extremely cool ❤️❤️? Dear Lisa every instruction is linked from under the photos. Where can we buy the book? And the cost?